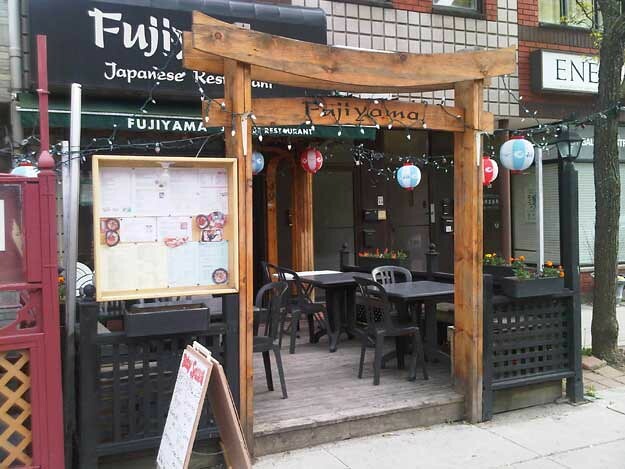 Fujiyama Japanese Restaurant is located on the small restaurant and patio strip of Baldwin Street in downtown Toronto. Baldwin Street is tucked in behind Dundas Street between McCaul and Beverly. Fujiyama, named for Mount Fuji, features a patio out front. Please read our conversational review, below. We decided to meet up at 5:30 on a Tuesday afternoon for sushi on Baldwin Street. We’re slowly venturing off the Yonge Street sushi strip, which is likely a good thing. As I made my way there on foot, I noticed there were a few other sushi restaurants on Baldwin. Possibly future reviews for Sushi Toronto. 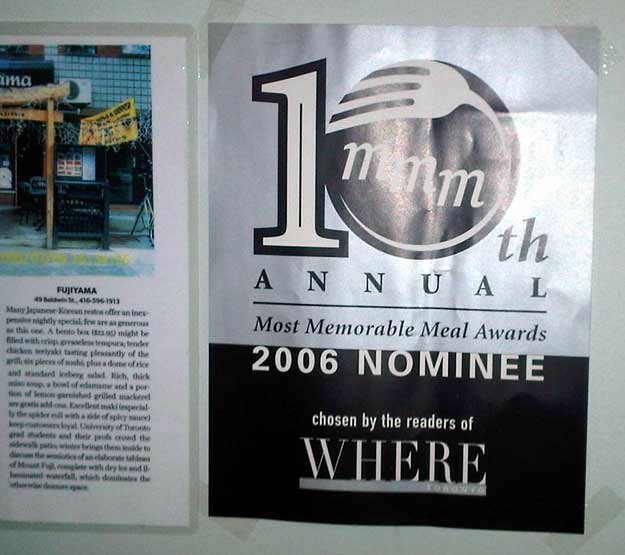 It’s kind of a cool/hidden area for all kinds of different restaurants. I believe there were a total of 4 different sushi restaurants within 2 blocks of each other. Fujiyama happens to be at the one end of the “restaurant row”. I was the very first customer of the night. That’s the first nugget of gold at Fujiyama. 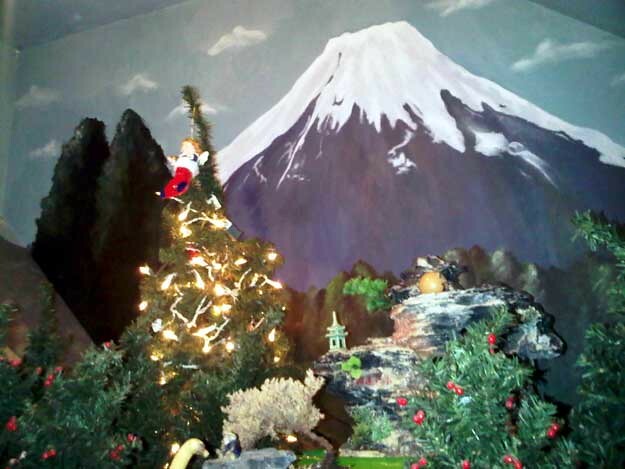 Perhaps the “center piece” of the whole restaurant is perfect replica of Mount Fuji with mini Christmas tree! No words can describe it. All this before we have even ordered our food. True,… we’ll let this photo below attempt to describe it. The complimentary edamame was there before I even arrived… although I didn’t partake, as usual. My Corona order was quick and came with the sushi-style lemon. Then we had a look at the menu. It wasn’t anything special. Basically something to gnaw on while you decide on what to order. It was a pretty full menu but I do detect the do-it-yourself home ink jet printer feel of the menus. Anyways, we decided to go with a mix of sushi and rolls settling on a Sushi/Sashimi platter and sushi pizza. Along with that, we had to follow the standard rule if they have a signature named roll, we must get it. Therefore Fujiyama roll must be ordered. 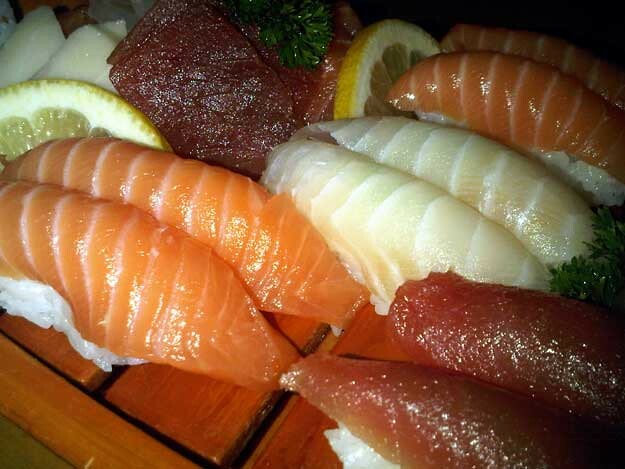 Yep, the ‘Sashimi & Sushi – Small (28 pieces for 2 people)’ runs $26.95. It’s actually one of the ‘Love Boat’ combinations, so, umm, perfect for us. 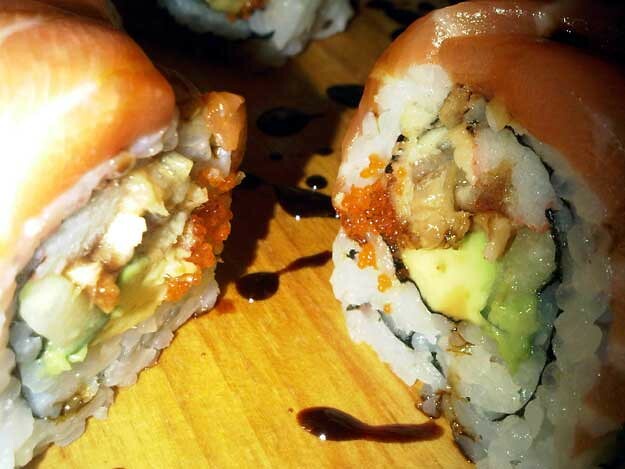 The Fujiyama Special Roll runs $9.95 and the sushi pizza $6.95. 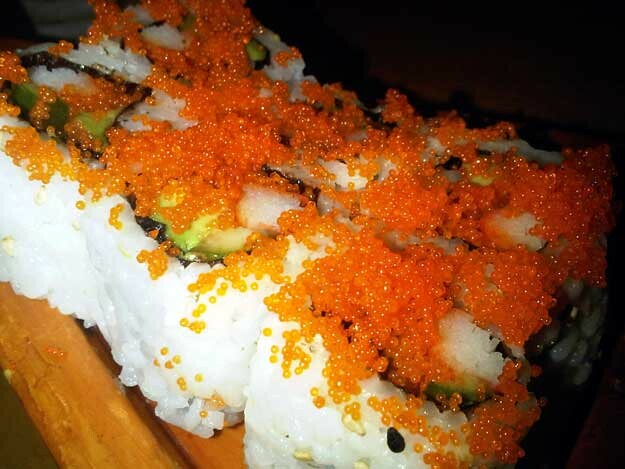 Other possible menu options include the Skydome Roll, the CN Tower Roll, and the Boston Roll. I suppose it is difficult to come up with names when there are a zillion rolls to name. First up came the soup and salad. I can’t complain about the salad. It was decent. The soup and salad were pretty much standard. I believe the first to come out was the “love boat”. You know I’ve noticed a trend lately that when we order the Sushi Pizza, aka an appetizer, it hasn’t come out before the main course in a while. 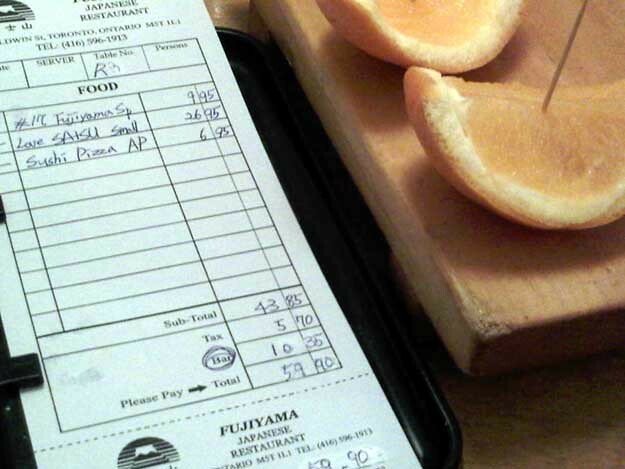 First thing I noticed was they didn’t skimp out on the sushi or sashimi. It looked pretty good and tasted decent as well. True, has the sushi pizza become dessert? The sushi was decent for sure. I’ve had better, but it was decent. I love when they put the wasabi right on/in/whatever the sushi. The sashimi could have been better, I thought. Not bad, but not great. The Fujiyama Special Roll arrived and was decent as well. Yeah everything was alright. Nothing was really bad or spectacular. It’s looking like it’s going to fall into my “yet another Toronto sushi restaurant” category. The place didn’t get much busier as at it’s peak, there were probably 3 tables taken. I was surprised by that actually. I figured on a nice day Baldwin would be hopping! I guess not. In fairness to Fujiyama, the other restaurants on the strip didn’t seem that busy either. What else? 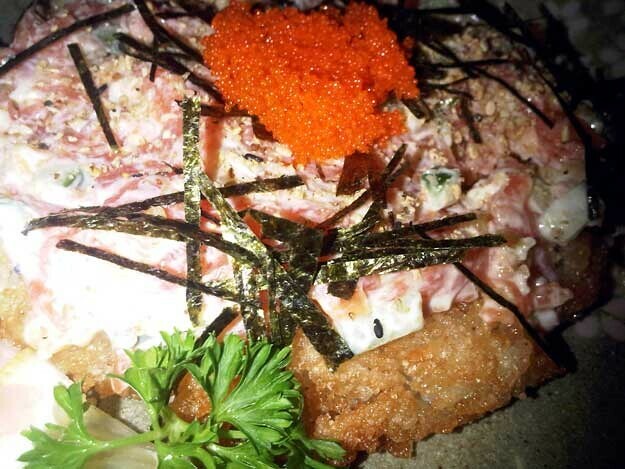 Oh, the sushi pizza wasn’t great in my books. It was too crispy for my liking. Also the toppings seemed a bit much. It definitely did not look like a healthy dish! The service was good. It seemed she forgot the sushi pizza in the initial order, but no biggie. Orange wedges accompanied the bill. Oh, I should mention there’s a small patio out front for those of you wanting to catch some rays while you eat. 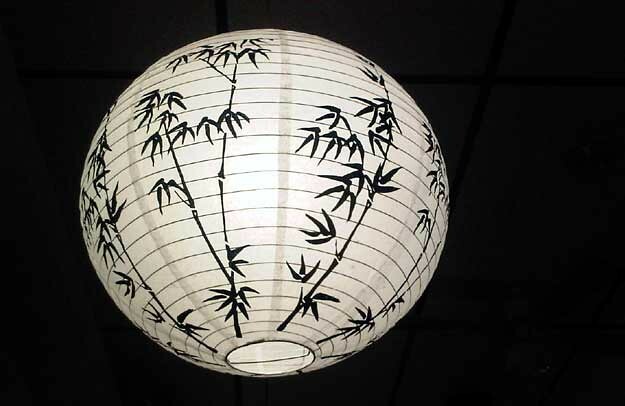 I’m giving Fujiyama a 7/10. ‘Yet another’, indeed. True the whole street really wasn’t busy. I figure it’ll pick up as we get closer to the summer. The food was passable but nothing to write home about. Oh and I decided to venture to the washrooms in the basement and they were not the cleanest. Oh well, as I was coming up the stairs I noticed the sushi chef on a laptop at the back of the restaurant. I guess even he knew it would be a quiet night! 6/10 for me.